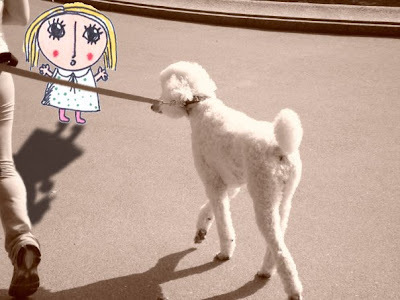 At exactly 02.47 PM on 3rd October 2007 in Central Park, New York, I discovered poodles scare me. At that moment in time a perfectly trimmed, white poodle was walking majestically towards me and I swear the pavement cracked underneath his paws: he was so big, he was able to look me in the eye. I used to beg my parents to get me a poodle when I was a little girl, but from that day on, my conception of a 'poodle' had changed. All information in our mind is stored in little boxes, which we then label with a name and fill with a memory, a rough concept and an emotion. My poodle box said 'cuddly; small and fluffy; happiness' but when I saw the poodle mentioned previously, my mind and my senses conflicted with what I thought a poodle to be and I was forced to renew my information box. I changed that into 'scary; BIG and fluffy; fear'. Then I realized there was another box which information was very similar to the giant poodle's, its label read 'monster'. Monster? Was this experience enough to turn a poodle into a monster??? There I was, standing in the middle of New York City in my most glamorous dress, trying to define the difference between a poodle and a monster. Our conception of what we consider to be a monster, has its roots somewhere in our babyhood and rarely gets an update in adult life. Meaning we end up dying with the same concept of what a monster is, as we used to have as a kid. 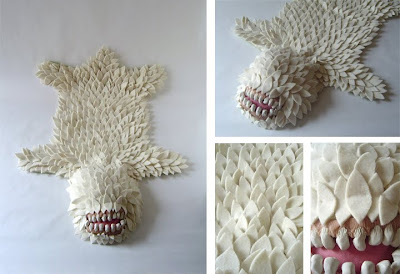 Some monsters are furry, others have shiny scales, most of them are blessed with a long row of pointy teeth - which have usually all sorts of disgusting things sticking between them - and practically all of our monsters are BIG. Really BIG. That's the thing about monsters: although we all have very different ideas on how he is supposed to look like, we all recognize a monster when we see one. But do they still scare us when we are grown-up? 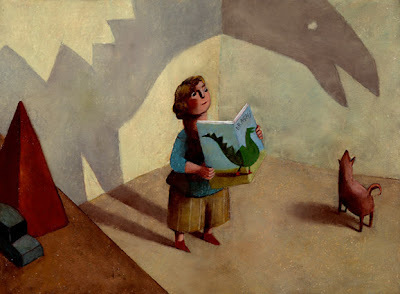 As monsters are such a big part of our childhood, we tend to loose our fear over the years. We put them in a perspective ('You are just one of the ten thousand things I should be scared of') and they get smaller. Sometimes, we even start loving them. Ray Harryhausen is an American film producer and a special effects creator most famous for his stop-motion monster animation. You might have never heard of him but does King Kong or the amazing fight between a man and seven skeletons in Jason and the Argonauts ring a bell? He is responsible for almost every monster you have seen in a 50s, 60s and 70s movies. Nice: The Pixar film Monsters Inc. pays homage to Harryhausen in a scene where Mike and Celia visit a restaurant named "Harryhausen's". Twenty years after he had drawn them, Italian illustrator Ericailcane’s parents showed him his first childhood drawings featuring monsters and fantastic creatures. 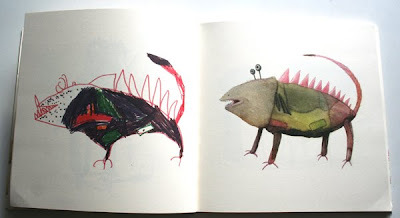 He then simply redrew them and published them side by side in the wonderful book Potente di fuoco. Isn't this the most accurate definition of a monster? I love this illustration, no words could ever achieve this image. Visual artist and writer Matteo Gubellini has just become a dad and I am slightly jealous of the fantastic world he will create for his child. But I am sure this experience will sparkle his own imagination even more. 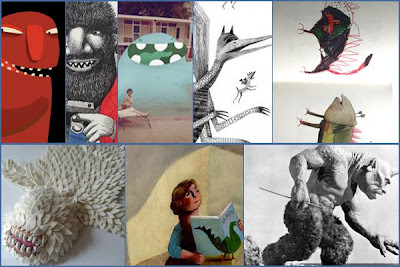 Relleno de Mono, a talented illustrator from Chile, literally proves that monsters are not evil creatures. 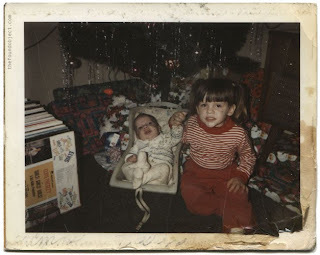 They are actually quite friendly as of all of his wonderfully manipulated Polaroids show. Wouldn't you love having a monster in your pool? easy t o discern: a subtle color palette, gentle line work and silent storytelling. Her monsters seem to have stepped out of a Brueghel's painting, with their mix matched bodies but how could someone with such elegant feet harm anyone? 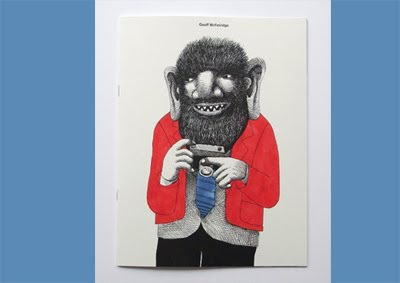 This book is a small collection of some of the work visual artist Geoff McFetridge has done for Spike Jonze’s film adaptation of the book Where the Wild Things Are. Like with all of his work, Geoff's attempts to manipulate with irony and imagination the way people look at things. You can see this is a monster but when you look at him closely, it becomes hard to see any monstrosity in him. So is he a monster? Joshua Ben Longo has an obsession with monsters and comic book heroes. That is a good thing: have a look at its portfolio and although sometimes slightly disconcerting, his work is so much fun! I want a house full of monster furniture too. Nobody could have said it better than Picasso: All children are artists. The problem is how to remain an artist once he grows up. Just keep checking under your bed every once in a while, ok? 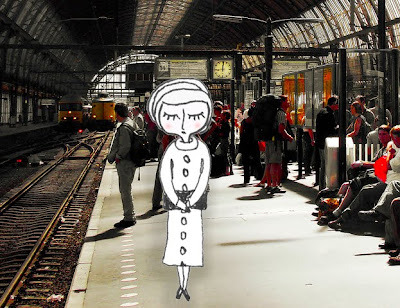 It was rush hour at the Amsterdam railway station and I was on my way to Brussels. The train was running late and as a consequence everybody was walking up and down the platform impatiently, moving in coordinated blocks. That's how I saw her: at one point the mass left a huge gap right where she was standing. At first she seemed motionless like a statue: an elderly lade, somewhere in her eighties, with wavy hair, a soft suede coat, a mohair turtleneck sweater, wonderfully cut pants and lovely flats. All of which was in the purest shade of white. She looked as if she had stepped right out of a Vogue winter fairytale. But the lady was conscious of everybody staring at her: young girls with their mocking smiles, young boys rolling their eyes in disbelief. The white lady's hands clutched more and more to the bag she had pushed in front of her like a shield. I thought she looked amazing. I went up to her and said 'Madame, you look beautiful'. A lovely smile broke her face in thousand wrinkles. She lowered her arms and thanked me. She smiled again and left. That moment was magical to me. I think of her words very often and while many people were there at that exact moment, none of them carries this memory with him or her. Not just beauty is in the eye of the beholder, life is as well. My Italian grandmother had a special way of dressing up: on important occasions she applied a hint of deep red Chanel lipstick with her index finger and sprayed a hint of No5 on her wrists. After that she was ready to be taken out by grandfather and indeed, although the changes remained unnoticed for the untrained eye, I could see her metamorphosis: she had shed her worker's coat and felt like a woman. It's important to train our heart to see things as they are, not as they look. Most of us have heard of Jonathan Harris. To me he was the pioneer of online story collectors. He is perhaps best known for We feel fine, a website which measures emotions through blog analysis. Another great project he did is I want you to want me, which gathers its data from online dating websites. The data is presented as an interactive installation showing a sky whose weather (sunny, cloudy, rainy, snowy, etc.) can be controlled by the viewer. Hundreds of blue and pink balloons float through the sky, each representing a single dating profile. Larry Sultan spent a decade photographing his mother and father, both retired, in a series of colour-rich and hyper-realistic portraits. Nearly all images were staged. Sultan was fascinated with fiction and suggested narrative. He depicted his parents as if they were lost in life, dressed up for no reason, waiting for things not to come. An example of how you shouldn't always trust what you see through the eyes of someone else. FOUND Magazine is a wonderful collection of found objects, love letters, birthday cards, kids' homework, to-do lists, ticket stubs, poetry on napkins, telephone bills, doodles. Memento's of someone else's life which sparkle the imagination of its finder. In this case, the finder is juist as intriguing. 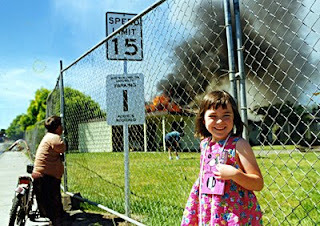 The photo shows an unsettling image of a laughing girl with a horrible fire in the background. The founder was a guy working at a photo lab who made copies of all the pictures he liked. 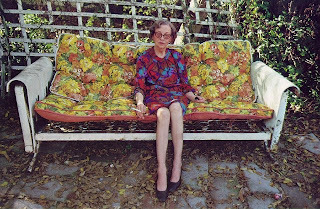 Flip through the pictures of William Eggleston and you will see mailboxes, fast food restaurants, convenience stores. But however common these places seem to be, in every picture he manages to capture a glimpse of a beautiful and colourful story everybody seems to overlook. 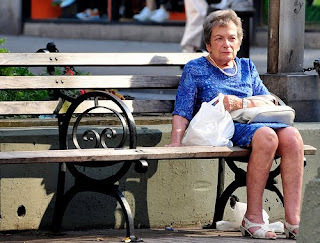 This old lady sitting on the swing bench embodies fifties coolness: cigarette in one hand, her striking patterned dress trying not to blend in with the background. Her legs are elegantly aligned which reminds me of Audrey Hepburn. When I look at her I see someone who would give everything to escape her own life. Rob from the.found.object is someone who started collecting found photos after finding a run over camera and developing its film. Why don't we all do this? Imaging having a photo album full of people you don't know: you could invent everything about them. Ted, 37, toothpaste tester. Mia, 25, hates flies and loves saying hello to people in the street. Mark Clarke’s Cabinets of Cures is a series of mismatched cabinets enriched with fascinating stories about its character. Each cabinet is created from found fabrics and everyday objects, and represents a series of surreal moments in medical history. This lady is the Countess of Chinchon, the wife of the Spanish Viceroy of Peru. When court physicians were unable to treat her malarial fever, she turned to an alternative native remedy: Cinchona bark. 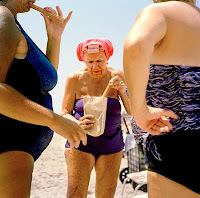 Another photographer, another picture I love, from Juliana Beasley. In the obviously staggering heat, three dressed up ladies in their golden age are having a snack-moment. At least one lady is wearing a bra underneath her bathing suit and at least one other has curlers in her hair, but they all have perfectly manicured hands and are wearing make-up. Isn't it wonderfully obvious that these ladies love being themselves? I tend to collect little broken objects. Or other things with no purpose. At one point a flatmate lost his coolness about this and commanded me to throw all the useless crap out of the house. But I didn't wanted to. 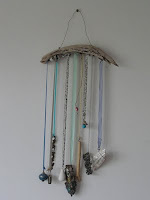 So I started making hanging mobiles with all the little bits I had. The objects were still useless but by being part of something bigger, they had turned into pages of a wonderful book. I was born on an island shaped like a three-legged monster and rugged like an old fisherman's forehead. The sea has always been renowned for its abundance in marine life, especially sword fish and tuna. But the land was poor of animals, except from the usual fauna you can see anywhere: mice, swallows, pigeons, sparrows, lizards and many insects. When I hit the magical age of eight, a zoo opened its gates on our island. I loved animals and could spend hours reading my Animal Kingdom encyclopedia, so my parents took me there on a lovely Sunday morning. We were the first people entering. Trembling with excitement I walked around its cages. Unfortunately the zoo hadn't managed the funding to get enough animals to fill them so most of the structures were empty. Outside the cages mice, swallows, pigeons, sparrows and lizards seemed to prosper, just like on the rest of the island. The largest cage of all was situated next to the play area (one slider and two see-saws). At first glance it appeared to be sort of empty too. Then I noticed one animal I had only seen in my Animal Kingdom encyclopedia so far: a praying mantis. I didn't dare to breathe or move and sat there motionlessly on my knees observing the little creature observing me. Suddenly she started moving towards the bars. Gently and elegantly she hopped out of the iron cage and hid under a waste basket. 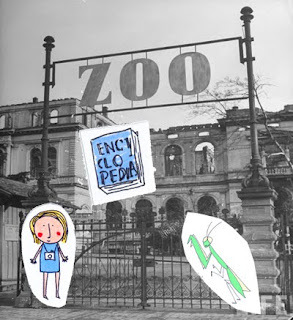 There I was, standing in a zoo, surrounded by free animals and empty cages. Had the world itself become a zoo? Context changes meaning. A chair looks weird in the middle of the street but normal at home. And how can you call a zoo a 'zoo' when it has more animals outside than inside his cages? Let's say we let art run free of context. What will we find when we go on an imaginary safari chasing art? He then sent the music to the photographer, Paulo Pinto, who he had Googled. Pinto told his editor, who told a reporter and the story ended up as an interview in the very same newspaper. I can assure you will end up telling everyone you know about it too. 3. Walking along the windy Dutch coast, you might find many things on your way like wiggly jellyfish, thousands of grey-coloured shells and beautifully washed wood. But chances are you could also find yourself staring at a herd of enormous plastic animals. These 'strandbeesten', beach animals, are given life by Theo Jansen. 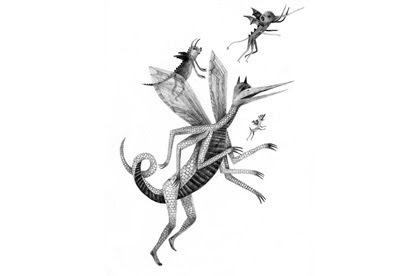 Jansen is a physicist who once invented a painting machine after which he dedicated himself to creating a new species: giant skeletons resembling dream animals and are able to walk on the wind, their life source. Some of these creatures can capture and store the wind. Others have the ability to anchor themselves in the sand when the wind threatens to blow them away. All of the animals are set free. Strandbeesten is a wonderful example of engineering being kissed by art. 4. Have you ever watched Jim Henson's Labyrinth? 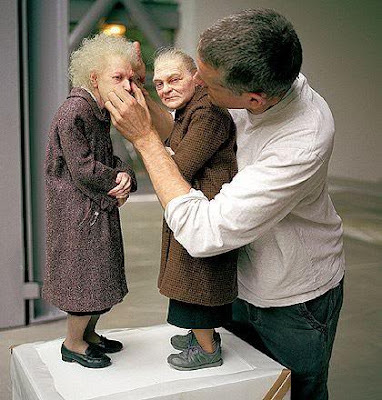 Ron Mueck was one of its model and puppet makers. This Australian hyperrealist sculptor works in London creating perfect human figures using fiberglass resin or silicone. The only unreal aspect of his work is its scale, all his figures are either oversized or undersized giving YOU the feeling of being undersized or oversized. The first time I saw his work I simply stopped blinking. Afraid I would miss a furtive, tiny movement from the sculpture I was looking at. 5. It's not just humans who can create art based nature, engineering and imagination. 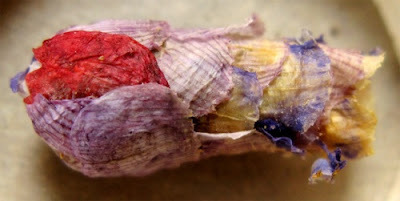 A rare species of solitary bees found in the Middle East, called Osmia avoseta, constructs its beautiful nests from petals, creating pink, yellow, blue, and purple chambers for its larvae. 6. Our imaginary safari ends on the shores of Zadar, in Croatia. Simple and elegant steps, carved in white stone, were built here on the quayside: underneath you will find thirty-five organ pipes. Day and night sea waves push air through them, playing strange and unworldly musical chords, resembling a whale cry.